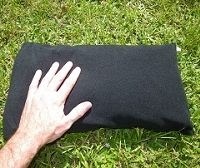 As you may have seen in my gear list, I have been using the Mont Bell blow-up pillow (68g) for a couple of years. This Xmas trip I am trying out the Zpacks stuff sack pillow (47g). Basically this will drop the Mont Bell pillow weight off my pack weight, bar the weight of a small square of fleece. Joe at Zpacks has taken the normal cuben stuff sack that I use for holding clothing and sewn soft micro fleece to one half on the inside. 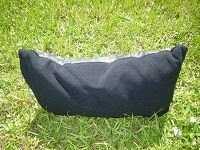 You just flip the dry bag inside out as shown below and fill it with your spare clothes and gear to use as a pillow! The fleece is more comfortable on your face than the plastic feel of a normal stuff sack. It has the same normal roll top and the seams are all taped, as usual. As with my blow-up, I'll use two strips of velcro to keep the pillow from slipping off my mat (see earlier post on the NEO ultra light mat). I will report comfort rating, verses blow-up pillow after Xmas trip. UPDATE - Following Xmas trip pleased to report pillow worked great. Depending on your clothing inventory, you may want to investigate the larger size? I am OK with medium. I will stick with this configuration for my PCT trip. I love my Zpacks Pillow! I think I ended up getting one of the first ones because he didn't have two sizes when I bought mine. I think it's the best way to keep my gear dry and have a more comfy pillow than even some of the blow up ones.